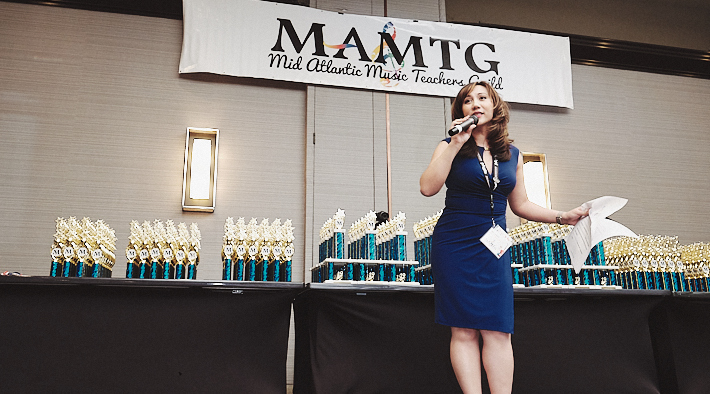 TS Founder Lisa Villamaria Casia hosts the 2019 MAMTG Awards Ceremony where schools from seven states meet to compete. Congratulations to all fall recital participants. Guitar was a refreshing new addition to our performances this year! 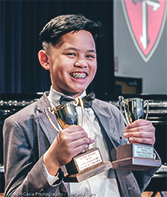 TS is ranked as one of the Top 3 Music schools in Jersey City! 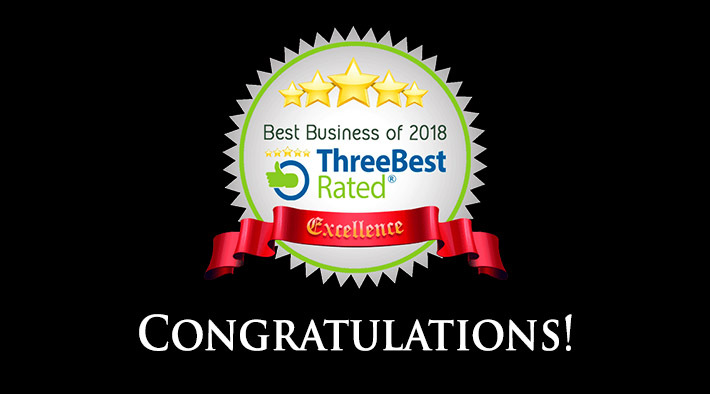 Theater Steps is ranked by Three Best Rated for providing consistent high quality business in Jersey City! 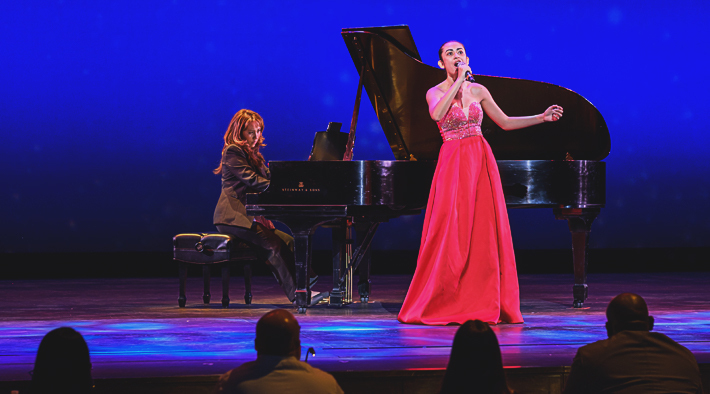 Samantha performs for the judges and audience at Victoria Theater at NJPAC. Congratulations to the select few students on earning your NFMC Gold Cups! Music lessons are tailored to the individuals’ needs. Voice, guitar, and piano lessons are available in a private one-on-one setting. Select a category below to find out more information. For young singers and their parents, it can be very confusing between vocal lessons and vocal coaching. A vocal teacher focuses on technique that is appropriate for the age level and maturity of the student where a vocal coach focuses on the presentation and delivery of the song. Theater Steps instructors are trained in both giving each student a collaborative balance of breath control, vowel placement, and tone execution with the song delivery for every age level. Visit the Lessons section to learn more. Learning to play the piano is a valuable skill and a way of expressing yourself creatively. Learning to play the piano develops fine motor skills, visual skills, and listening skills all at one time. 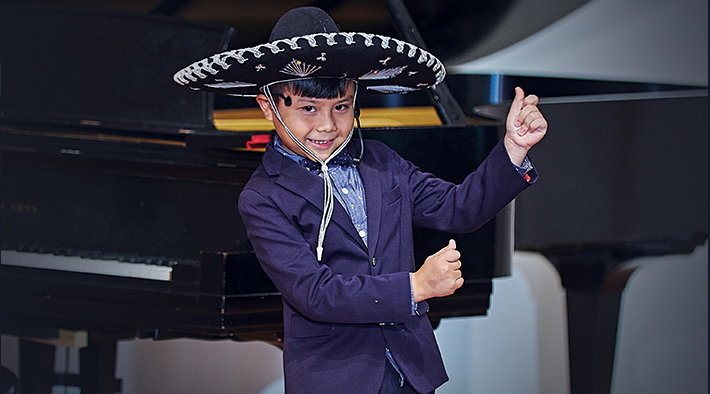 Piano lessons encourage discipline in learning the basics of music, reading notes, learning scales and music terminology that builds greater connectivity in the brain. Studies have shown that piano lessons enhance analytical ability and creative problem solving that aid in everyday life. Playing the guitar will mean learning totally new hand and finger movements, almost like learning to walk. Guitar lessons strengthen hand muscles allowing you to learn very precise, coordinated finger movements as well. The only way to learn these movements, improve your hand muscle memory, and really progress at playing the guitar, is to practice regularly. Young budding musicians are given lessons that cover a wide range of concepts through exercises, activities and movement. Children and adults learn differently. Children are quicker at adapting the motor muscle skills without it feeling awkward. Adults sometimes have to relearn motor skills correctly although they are able to pick up concepts quickly. Theater Steps Early Childhood lessons offer a variety of musical games that help young children retain concepts through experience. 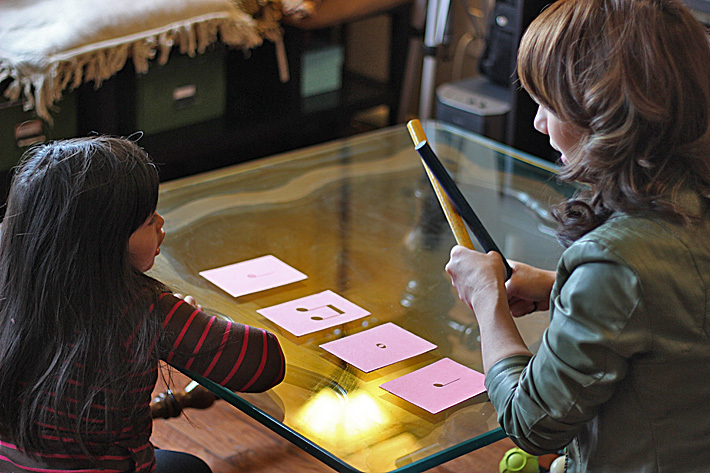 This early music development will prepare students for note reading in any instrument. Register for your introductory trial now! Know what to look for in a professional music teacher. Find out the advantages of learning in a music studio environment. Browse these topics and more in our Knowledge Center articles. Choosing the right teacher can be a difficult journey. Review this article to be aware of necessary skill sets of teachers and costs involved. Understanding your instrument and knowing how to take care of it are essential to progressing in your musical education. Know how to establish proper breath control, and develop your muscles while minimizing strain on your body. Theater Steps students have the opportunity to display their talents at yearly festivals, competitions, and recitals. Check out the following videos of their latest performances. Visit the TS YouTube page for more videos. TS faculty are officers of reputable national and regional standards based musical organizations. 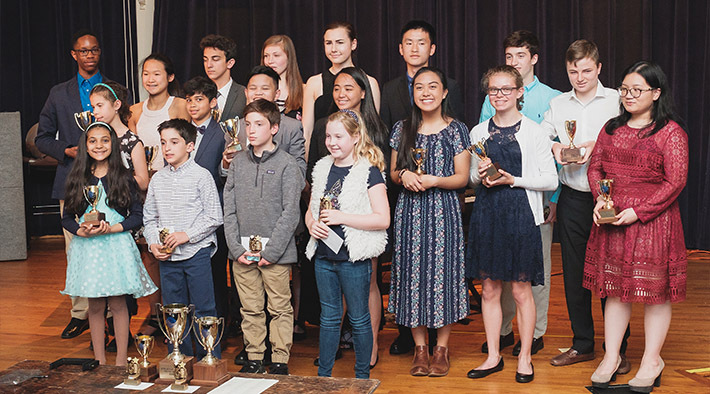 Be a part of New Jersey Music Educators Association (NJMEA), Mid Atlantic Music Teachers Guild (MAMTG), National Federation of Music Clubs (NFMC), and National Association of Teachers of Singing (NATS) evaluations and competitions. 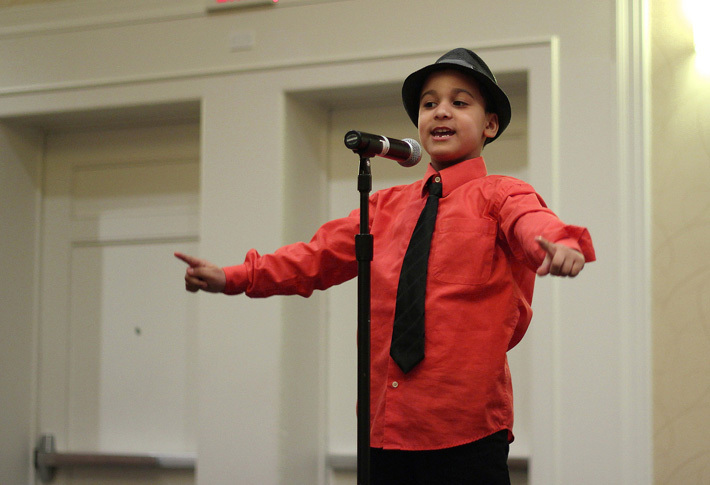 Participate in annual Theater Steps recitals. Get the latest info from us through social media. Share your musical experiences with the TS community! Connect with us! "Like" our page on Facebook. Theater Steps instructors provide services for students of all ages in West New York, New Jersey. Participating students travel from neighboring cities including Jersey City, Hoboken, New York, Weehawken, Harrison, Secaucus, Kearny, Bayonne, Union City, Newark, North Arlington, Guttenberg, Belleville, North Bergen, Lyndhurst, and Fort Lee. Students get to know each other through social gatherings, yearly festivals, competitions, and recitals. Learning to sing and play the piano involves a great deal of patience and commitment. Theater Steps will help to develop techniques with ear training and sight reading while maintaining and improving proper health conditions for your body. 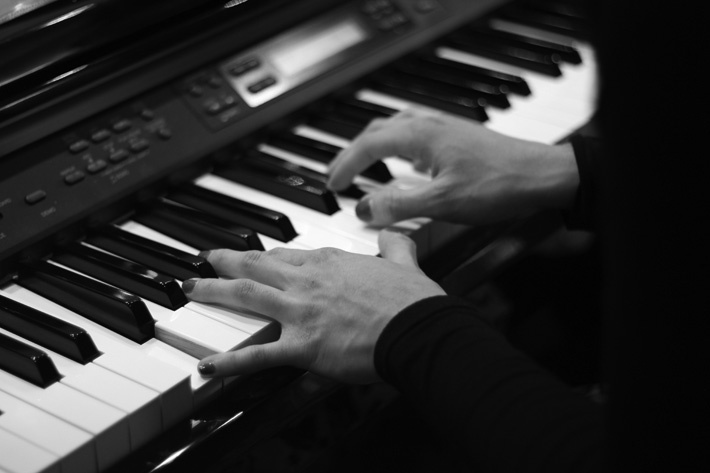 If you have an interest in learning classical, musical theater, jazz, or pop music, read more information about our available lessons.